Home » » Will ecotourism be good for the Turtle Islands? A group of small islands in the southern province of Tawi-Tawi has long been the birthplace of the gentle and resilient green sea turtles, which is said to be the oldest reptile species in the world. More than 2,000 of the turtles known locally as “pawikan” nest in the islands every year. Other species, such as the hawksbill turtle, also frequent the area, which lies south of wildlife bountiful Palawan. Such distinction has earned the island cluster the name Turtle Islands, the last major green sea turtle sanctuary in Southeast Asia and one of the only 10 remaining nesting sites all over the world. Its remote location and lack of regular means of transportation has made the Turtle Islands, which was once held by the United Kingdom, highly untouched despite the Philippine tourism hype. But that may soon change. The government has announced that ecotourism projects are being planned for three of the six major isles which are part of the municipality of Turtle Islands. The effort has been launched amid an observed increase in the number of tourists visiting the area in recent year, a statement from the Mindanao Development Authority (MinDA) showed. The government agency cited local tourism records, which reported a total of 1,139 local and foreign tourists in 2012, up from only 1,058 for the aggregate of 2010 and 2011. 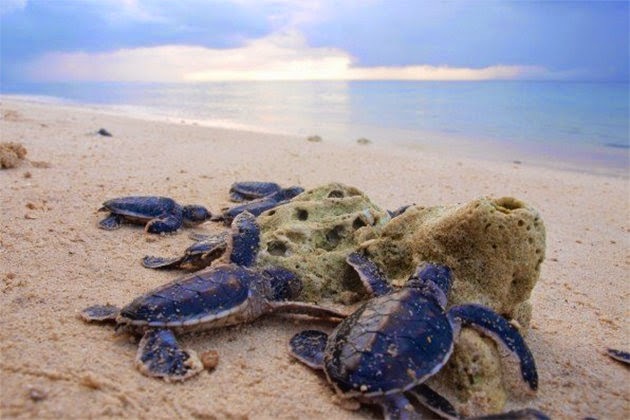 “Tourists visit us to witness marine turtles lay their eggs or watch the hatchlings struggle out of their nests and make their way to the sea,” MinDA quoted Tawi-Tawi Governor Sadikul Sahali said. “We need the appropriate facilities that will not only accommodate our tourists, but also ensure the safety and protection of the turtles and their nesting sites,” Sahali said further. Secretary Luwalhati Antonino of MinDA said a budget of P30 million has been secure for the project, bulk of which will be from the Tourism Infrastructure and Enterprise Zone Authority. The projects will include elevated wooden boardwalks, turtle watching lounges and several cottages for the islands of Taganak, Bakkungan and Baguan, the most widely visited islands. The facilities, MinDA said, will protect the turtles from tourists while allowing visitors to observe the experience they made the trip for: watching the gentle creatures lay their eggs at night. “[R]esidents of Turtle Islands can earn sustainable livelihood by promoting this famous attraction, while ensuring the protection of the endangered species and their nesting sites,” Antonino noted. She added that the initiative is part of the Brunei Darussalam Indonesia Malaysia Philippine East ASEAN Growth Area’s programs to protect the Greater Sulu-Sulawesi Corridor’s biodiversity. “A full resource accounting should be conducted and its carrying capacity determined before any development is started,” Greenpeace Southeast Asia oceans campaigner Vince Cinches said in an email. The International Union for Conservation of Nature and Natural Resources tagged all marine turtle species as endangered due to the critical decline in the world’s marine turtle population. In the Philippines, the Department of Environment and Natural Resources in 1979 launched the Pawikan Conservation Project to address the dwindling number of local marine turtles. Turtle Islands has been declared a protected area in 1997 by the Philippines and Malaysia, which governs three of the islands in the cluster. It was the world’s first transboundary protected area. “Moreover, the ecotourism plan should be jointly developed by local communities, scientists, non-government and civil society organization representatives, and other stakeholders,” he added. All ecotourism activities in the island should also be coupled with education efforts, Cinches said, adding that all visitors must undergo comprehensive briefing and be given guides on behavior in the islands. Aside fom marine turtles, the Turtle Islands is also home to 34 species of birds, 27 coral species, 128 fish species, 62 species of marine flora and other wild animals such as fruit bats and reptiles. “Ecotourism, as long as developed strictly in accordance with ecological principles, is one of the many services a healthy ecosystem gives,” Cinches told Yahoo Philippines. “If indeed, Turtle Island Wildlife Sanctuary will be opened to the public, it should be a model for sustainability and one that will ensure true protection of our marine ecosystem rather than just a revenue-making strategy,” Cinches said.